I briefly had a new found interest in Hindu mythology reading Devdutt Pattanaik cover to cover, books after books till I was ‘myth-ed’ out. The artistically accomplished author broke a new ground with a genre that until now was exclusively a subject matter of somniferous tele series or grand parents. His skilful illustrations were a major success in keeping me from falling asleep facedown between the pages of such books. They brought back a self left behind. One that buried its nose in lots of beautifully illustrated children’s books and spent more time on illustrations than text. I found these books thought provoking and broadening and at times even upsetting and eventually resetting my beliefs, having known a very narrow and unquestionable view of mythology when in reality (if I can use that word) it was more prosaic and relatable. But then, they are all lores & tales that lost their true intent and meaning along the way. 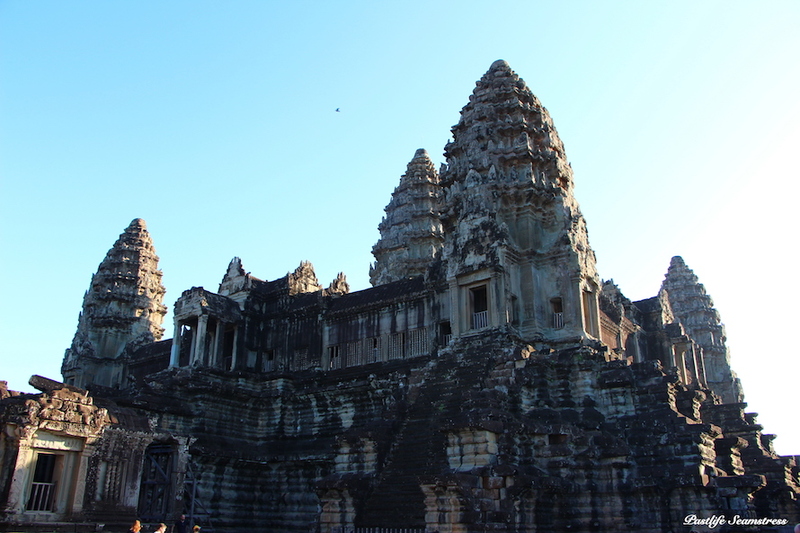 It was also around then that the idea of visiting Siem Reap germinated and nurtured. 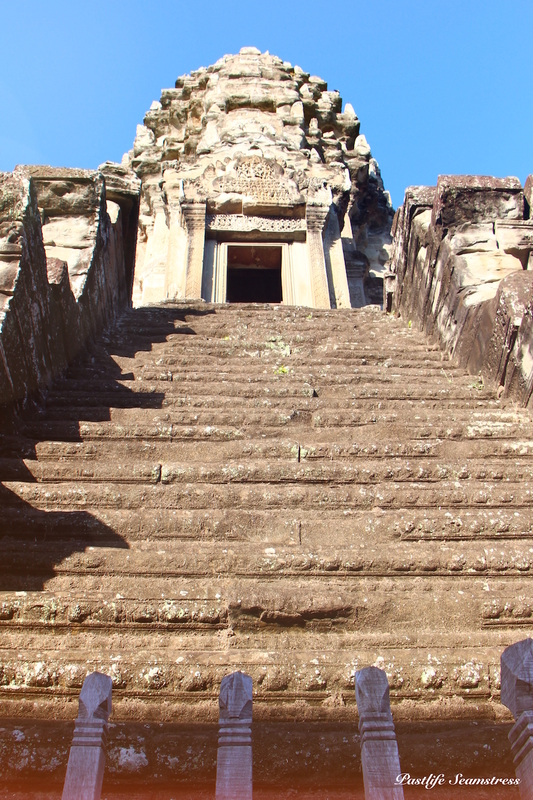 Consequently ‘the most wonderful time of the year’ was set chosen for Angkor Wat for its rising popularity, reliability of sunshine, history, grandeur, scale, photogenic quality in the same order. Also we wanted to see it while it’s remains (and our enthusiasm) still go strong. I was in renewed awe through the time I took to compose this post, juggling and working some lazy grey cells. Such is its spell. Early bird gets the best seat. Keep scrolling – the beating around the bush is over. 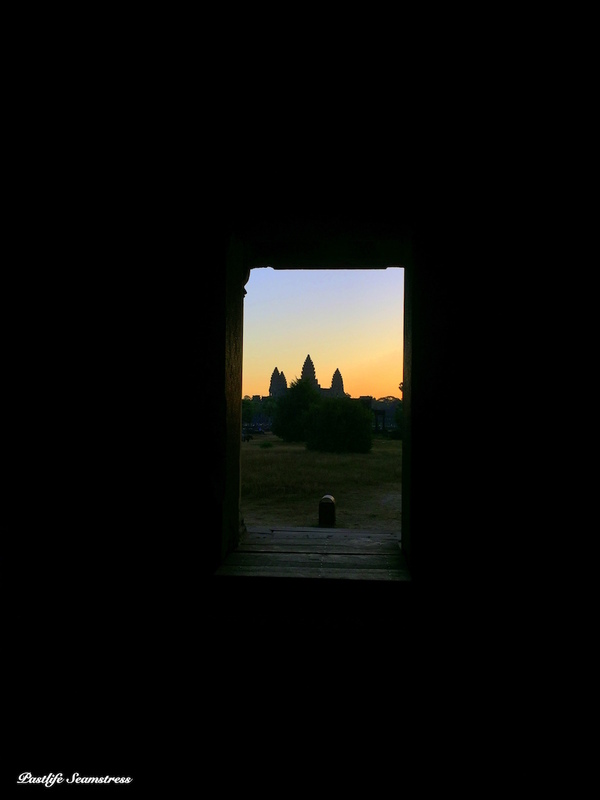 First rays of sun lighting up Angkor Wat temple complex – a unique architectural legacy of Khmer empire that ruled large parts of South east Asia. 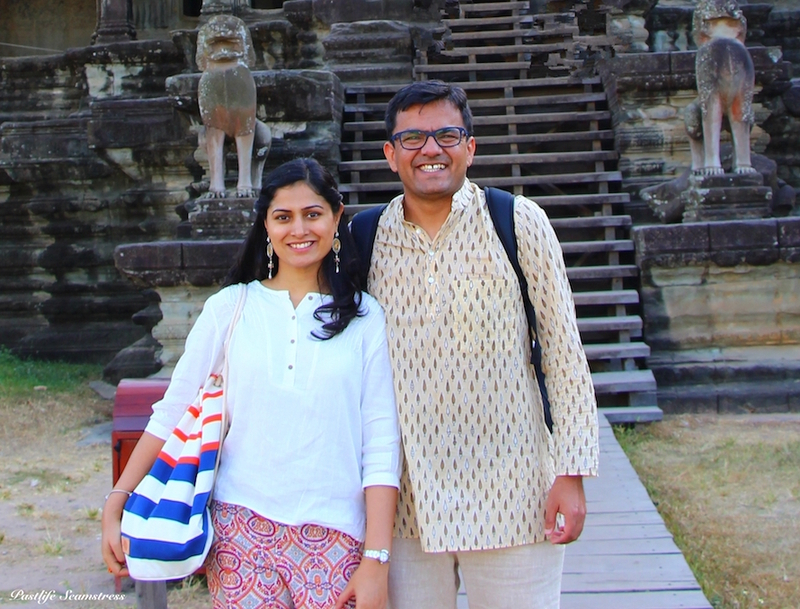 ANGKOR WAT literally translates to ‘Temple city’ and is, of course, a UNESCO site that is said to surpass anything built by Romans or Greeks in scale and grandeur. Owing to no traceable written records lores and legends abound. So many so that they are present in the very air you breath. 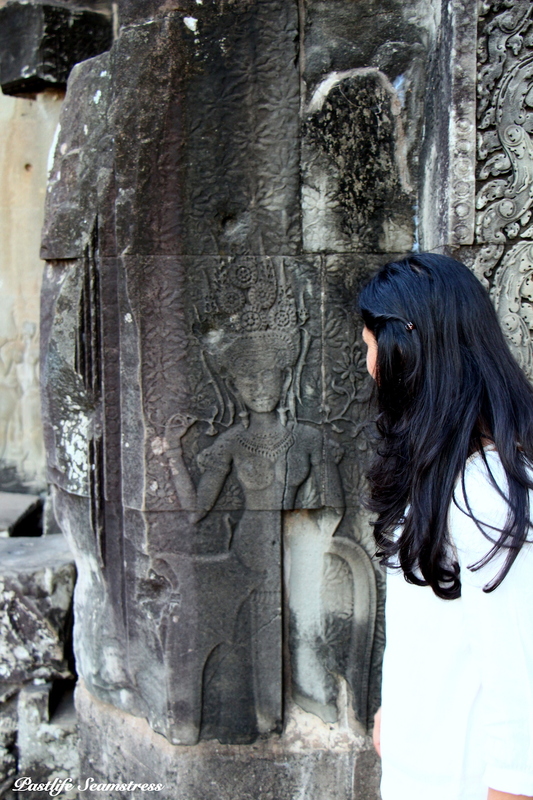 It was commissioned to be built in 12th century by King Suryavarman II. 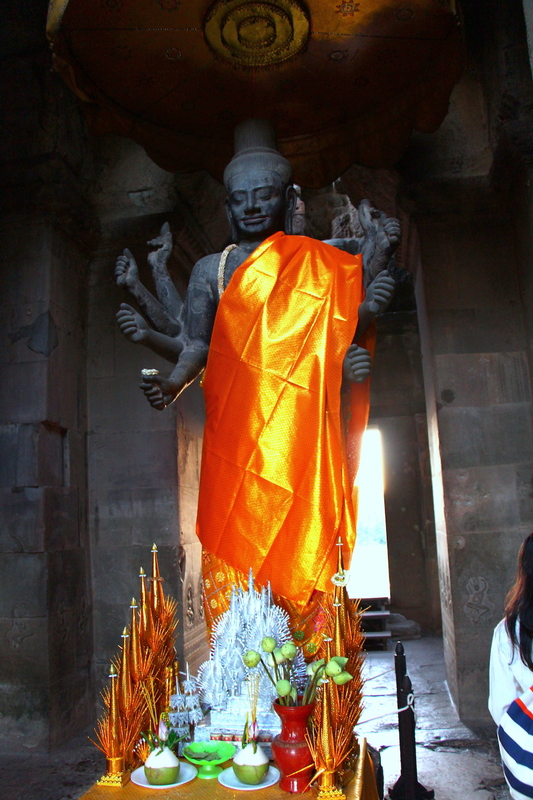 Since King Suryavarman II arrived where he did by treason and treachery therefore he had a number of subjects to appease. Undertake a grand construction in order to prove their worth, power and presence was what rulers did at that time. Besides, he was a staunch devotee of Lord Vishnu, considered himself a demigod and desired a place in heaven. 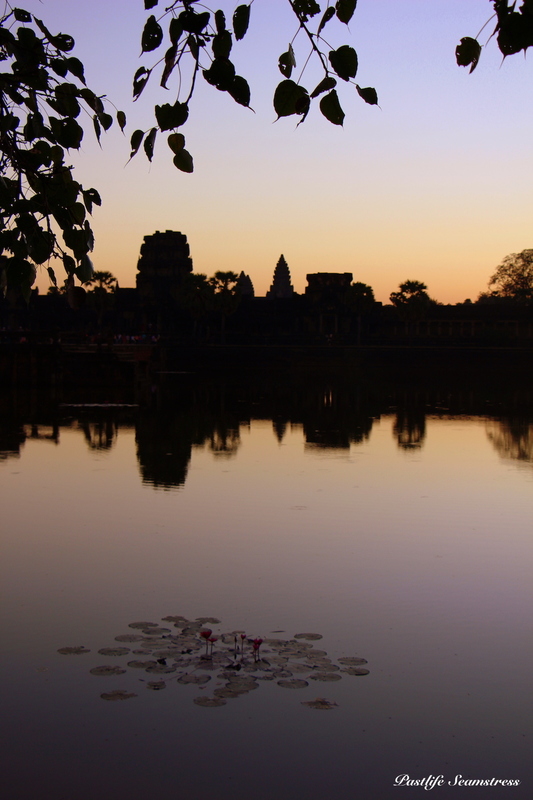 To guarantee one he ordered heaven (Angkor Wat) to be made right here on earth at the centre of his kingdom. 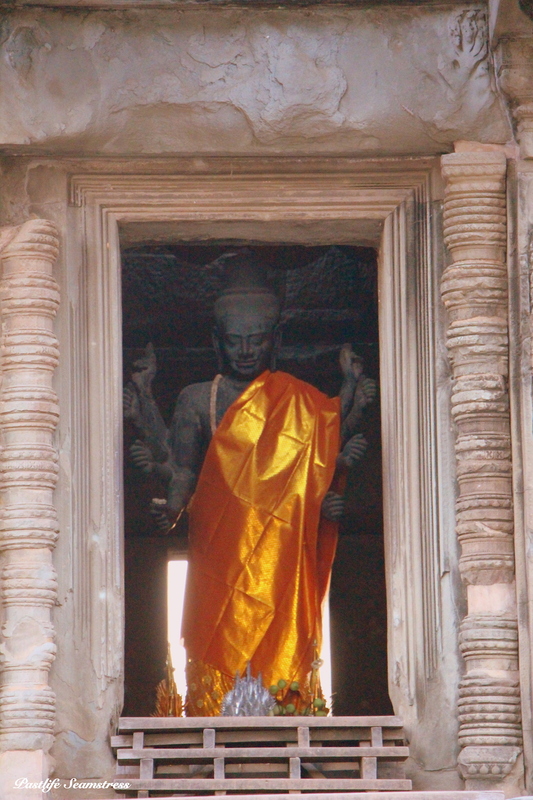 This was the central idea of constructing the temple. 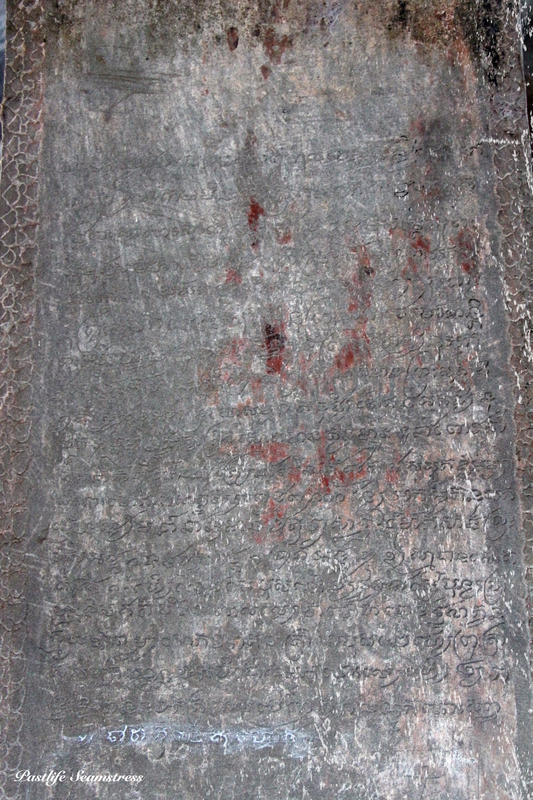 Originally dedicated to Lord Vishnu, the patron of King Suryavarman II. 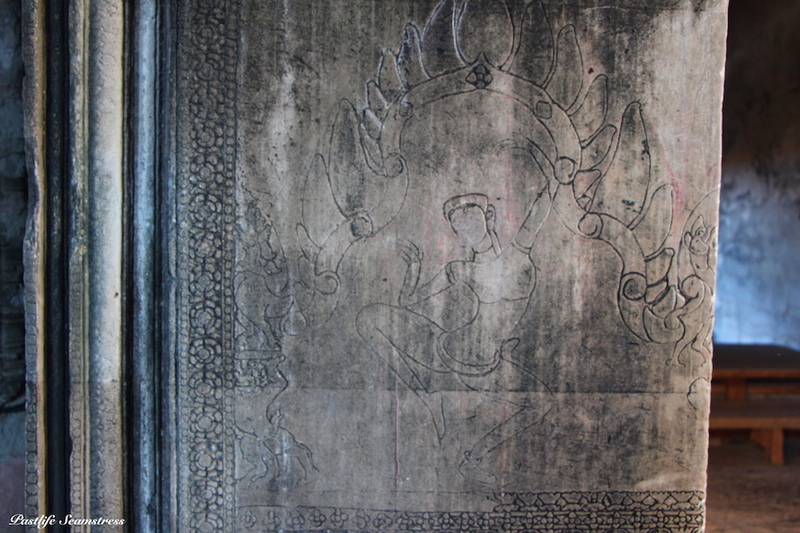 It gradually converted to a buddhist temple over the centuries. According to a legend the construction was ordered by Indra intending to build a palace for his son. Such legends get fortified by facts like absence of any signs of a settlement (like utensils, clothes, ornaments etc) in the process of discovering this marvel of a site. However recent surveys point to a megalopolis with very sophisticated water works. A restored Shesh Nag or the multi headed snake, often associated with Vishnu guarding the entrance to the temple. Our guide was quite insistent on taking a picture of us with the Nag for reasons best known to him. As the main bulk of audience makes retreat via this stone causeway post sunrise (see previous post), we moved forward with temple hopping following our peppy and stout guide to shrine of Vishnu. Morning cool and sparsity of crowds is something to be taken advantage of in the world’s largest religious complex. Therefore a big brekkie ritual is best left for another day – for a long day as this one – small frequent eats and lots of water keep energies more steady. The beatific looking Lord Vishnu aka Ta Reach once occupied the central shrine. Being early definitely has some perks gives some wonderful photo ops. Here’s how to have glowing skin: Hold your head straight and turn towards sun. No sun? Theres always photoshop. Author: Fairly digressive & leaning towards narcissism Caption: Too long! 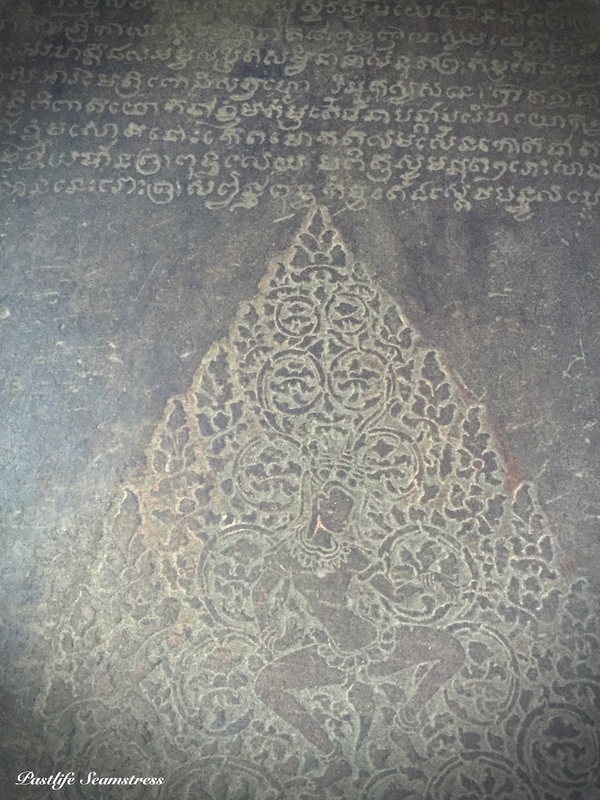 The inscriptions that are all over the place in Angkor Wat appear in several languages -Khmer, Sanskrit, Thai even Japanese. 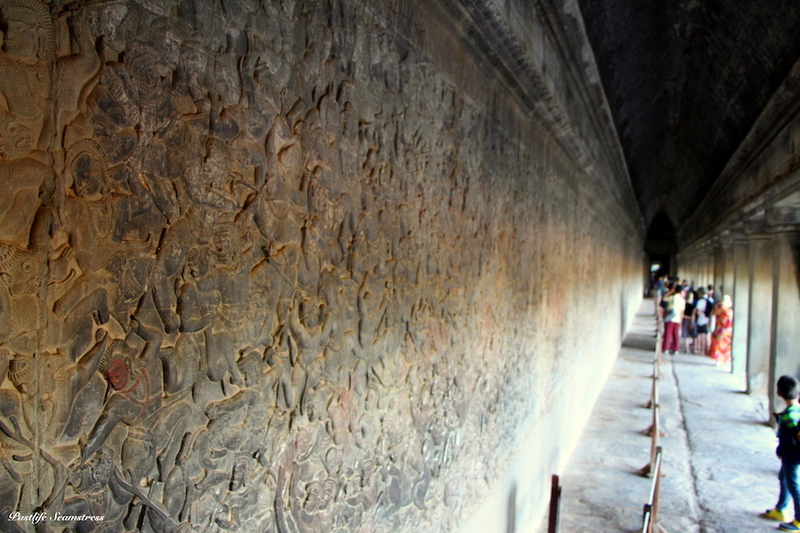 Since no written evidence exist, all that is known about Angkor Wat is through the said inscriptions and bas-relief carvings. 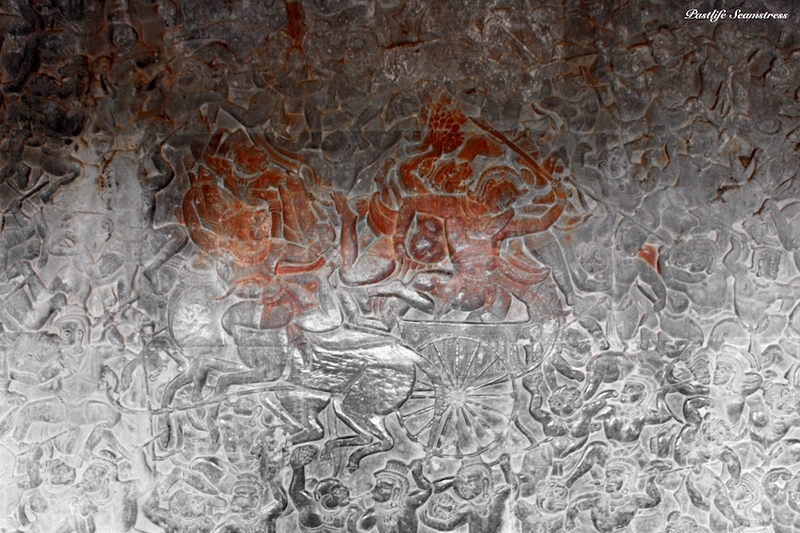 Extensive and detailed bas-relief carvings depict various scenes from Ramayan & Mahabharata, heaven and hell. Some of them could give you some major hairstyle goals! 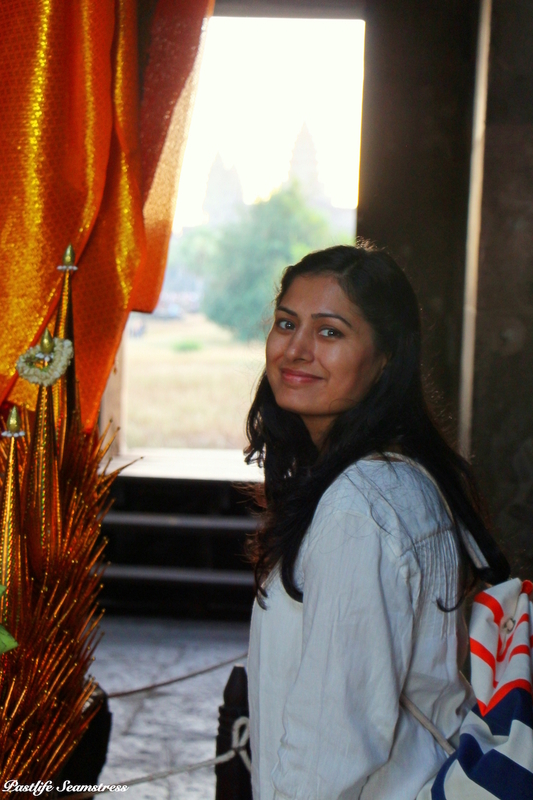 There’s virtually no surface of temple that is devoid of carvings. Each one more elaborate than other. 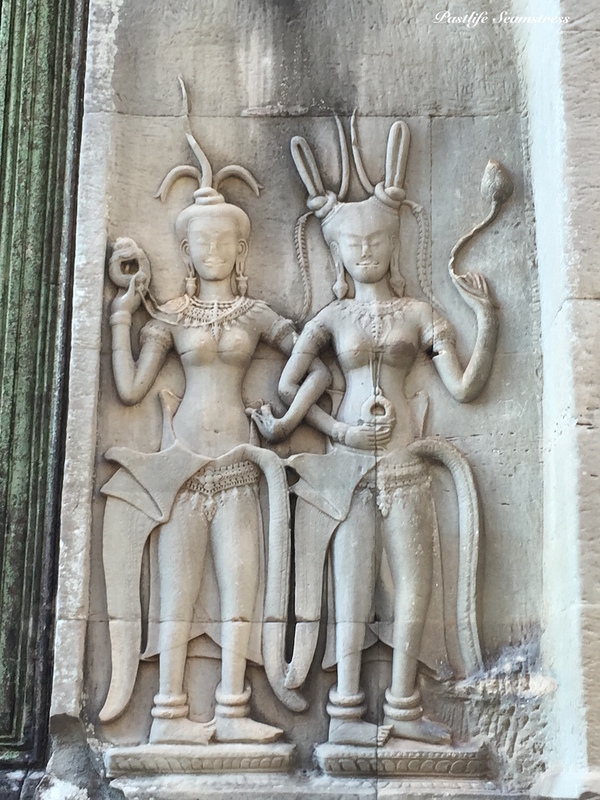 Some of the carvings in the temple remain unfinished that speaks of plans loftier than laid. 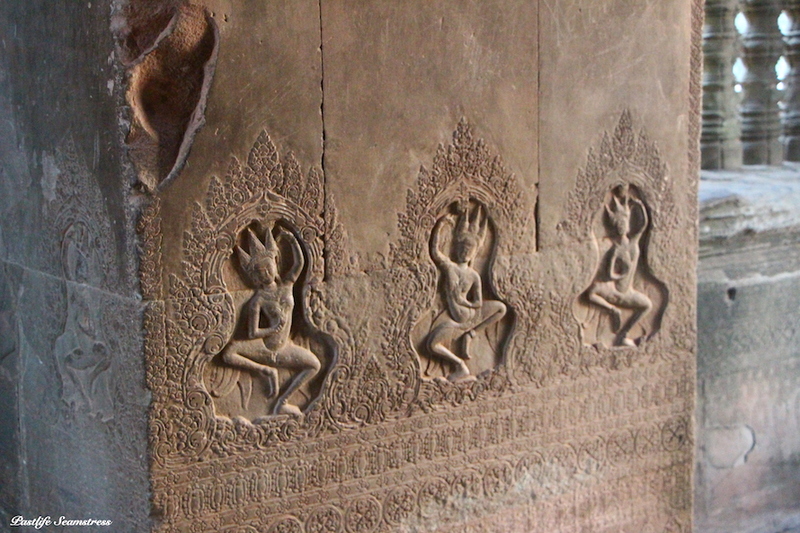 And this is not how the King would see these carvings back in the day. 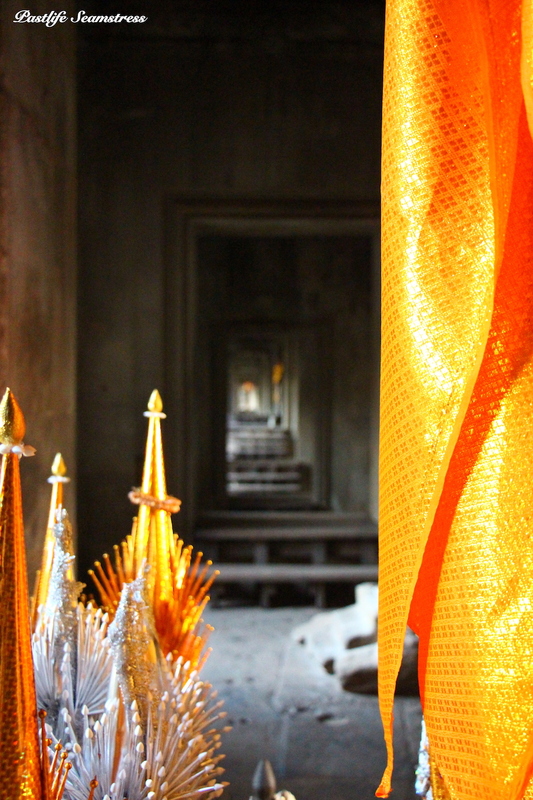 Rather they were covered in gleaming gold – fit for a king! These bas relief carvings in addition to depicting scenes from Hindu mythology epics, showed the life and times of the King along with his queens and infantry. It was the most effective means of conveying a message (that the King is Supreme) or a story (Hindu mythology legends) that came along with Indian merchants and traders to a largely illiterate population. 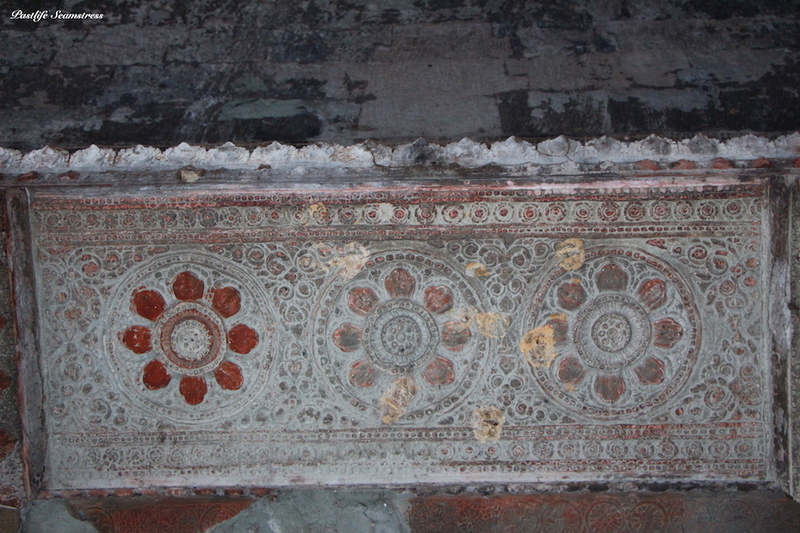 Lotus motif, a very common find on the ceilings. 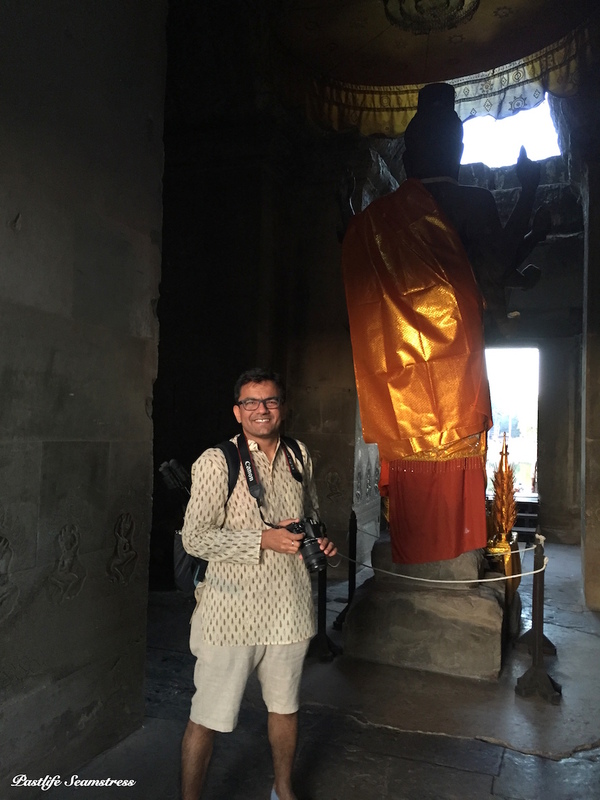 Along with the imposing silouhette of Angkor Wat that takes a proud place on their national flag, the Apsaras and Lotus is symbolic of Cambodia quite like the Taj Mahal, an elephant and auto rickshaw is to India. The central structure of temple has five towers arranged in quincunx. 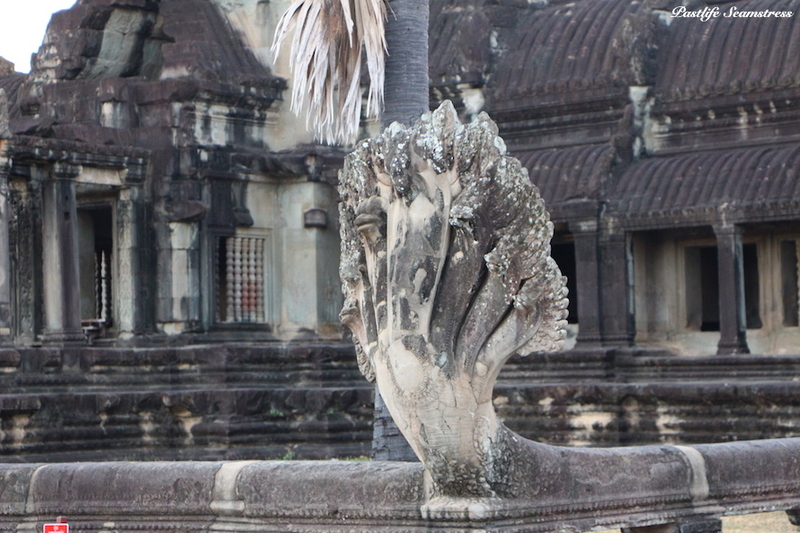 The towers resemble lotus buds and represents Mount Meru – home of Gods according to Indian mythology. Mount Meru is also considered the axis-mundi or the axis connecting heaven and earth. 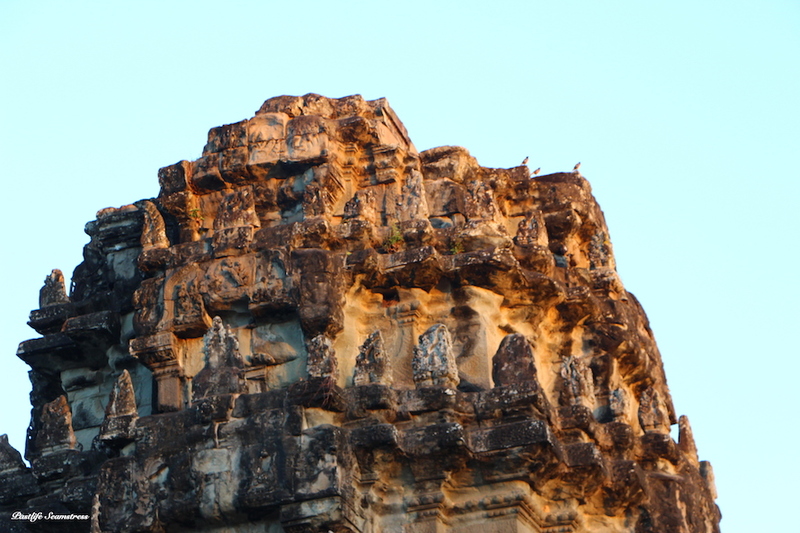 The general design of the temple complex is thought to be a microcosm or miniature replica of universe – so designed for King Suryavarman to have the highest seat in the cosmos. Am I delivering way too much trivia? Well I was suitably impressed is all I can say. The central structure of five stone towers lies on a raised platform that sits much like a crown on the entire complex. A steep flight of stairs lead unto the central shrine symbolising the onerous journey to reach God’s doors. 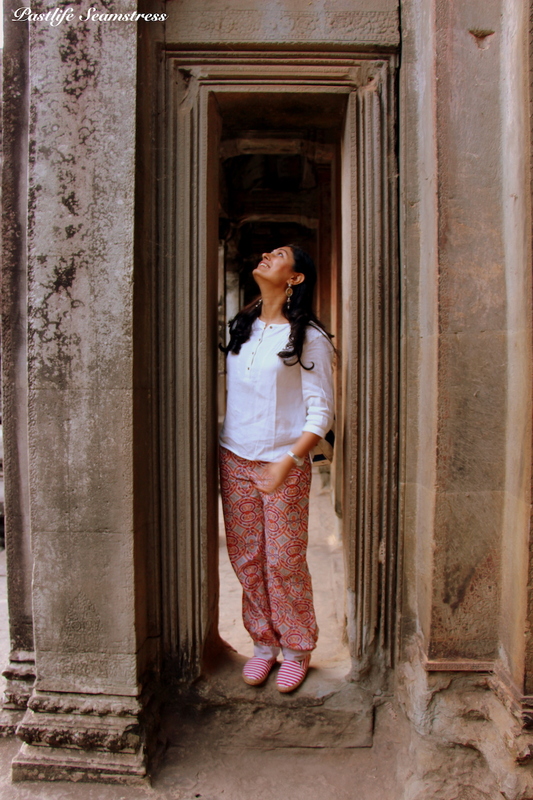 Human misfit in Apsara lined graceful perimeter of central shrine. 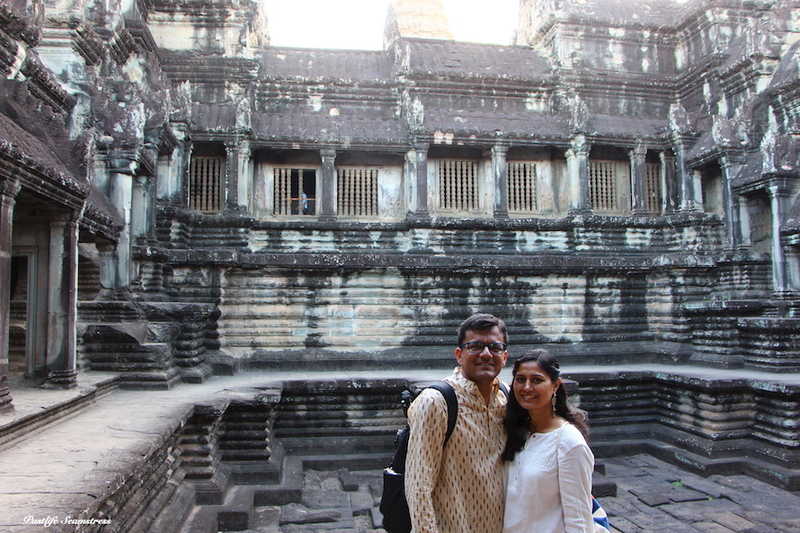 More of us in the massive impressive ANGKOR WAT. 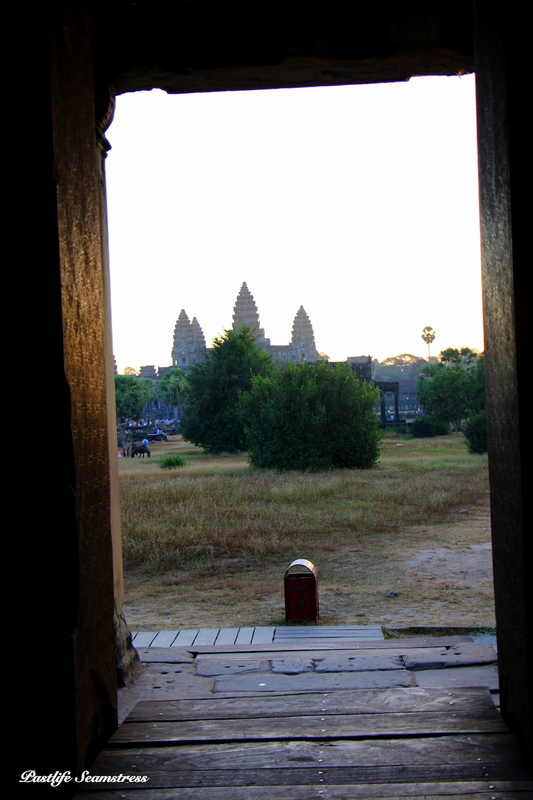 It took us about half a day and some viewing tactics to see this temple that took only 30-40 years to build. Its an architectural and engineering marvel for not just what meets the eye (for its span and size) but for what lies beneath (i.e water) as well being built on a swamp. Of the known events, it has survived wars, invasions, colonisations and the inevitable weather aberrations. Intriguing and stimulating and infallible in provoking visuals of a world lost and what lead to the conception of the idea and how it was put together and how it functioned. Not only were the faces behind long on brains, they had unparalleled vision and technique that with all the brain and muscle today remains a mystery. A mystery I highly recommend. Superb narration!!!!! Great pictures. 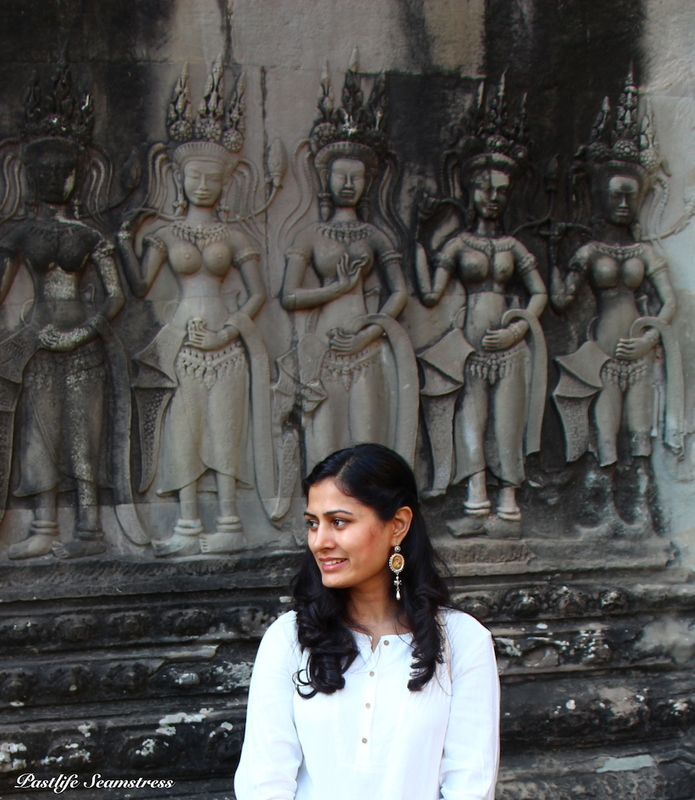 History,culture and art all are beautifully captured.A very interesting and informative blog.Keep it up Nikita.